Wild fruit woody species without any doubt present an essential element of biodiversity of Montenegrin forests. The aim of this paper was to examine the geographical distribution of these species as a basic precondition for their monitoring and protection. According to the National Forest Inventory in Montenegro, there are seven wild fruit tree species present: chestnut (Castanea sativa Mill. ), Turkish hazelnut (Corylus colurna L.), walnut (Juglans regia L.), wild apple (Malus sylvestris Mill. ), wild cherry (Prunus avium L.) and wild pears (Pyrus communys L. and Pyrus amigdaliformis Vill.). Seven analyzed species are spread over an area of 9498 ha which takes up 0,69% of the territory of Montenegro. Most common wild fruit tree species in Montenegro are wild pear, wild cherry and wild apple. The highest values of average timber dimensions show wild cherry, chestnut and Turkish hazelnut. Further analysis of the distribution according to the altitude shows which species are located mainly on terrains of lower altitude and which species spread mainly at altitudes above 800 m and how altitude influenced the diversity of these species. 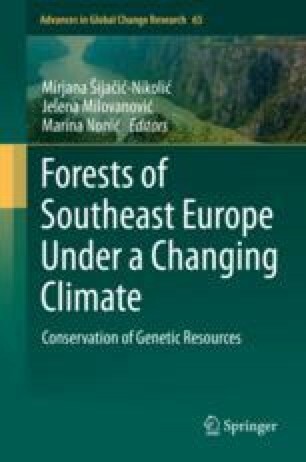 Distribution and main characteristics of Montenegrin wild fruit tree species shows potential for establishment of collecting site areas as first step of in situ conservation.